DERRY CITY: Hegarty hoping to play his way out of trouble! Derry City caretaker manager Paul Hegarty. DERRY City caretaker manager, Paul Hegarty, has vowed his team will continue to try and play their way out of trouble as he seeks to secure the Candy Stripes’ Premier Division status over the remaining four Airtricity League games. Since taking over from Peter Hutton, Hegarty has led Derry to an impressive 1-0 home victory against Shamrock Rovers before securing another precious point in Friday’s scoreless draw with high flying Cork City at Turner’s Cross. But it was not just the result in Cork which has lifted spirits among the both players and supporters, Derry outplayed Europa League chasing Cork for most of a low key match and really should have taken all three points with Ciaran O’Connor, Cillian Morrison and Stephen Dooley all missing clear-cut chances to win the game. 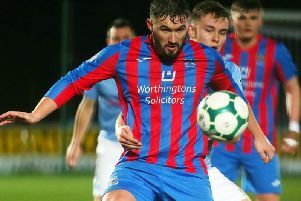 Far from looking like a side lacking confidence, Hegarty’s players built from the back with some style and took the game to the home side, something the caretaker manager wants to see his side continue over the coming weeks. “I don’t think we can play any other way, we have to have a go at teams,” explained the Ballindrait man. “To be fair to the players they did what we asked them to do before the game. We pressed Cork high up the field as much as we could and we tried to play from there. To give credit to the players I thought some of the football we played at times was exceptional. The one dark cloud on the ‘Hegarty horizon’ however is a growing injury list that saw Ger Doherty, Patrick McEleney and Philip Lowry all missing the Cork match. Ryan McBride has also been playing through the pain barrier but the Brandywell native was superb in Friday’s stalemate. With crucial games to come against Bray Wanderers (Brandywell, October 9th), Limerick (away, October. 17th) and Bohemians (away, October 23rd) before the season finale in Longford on October 30th, the ‘free’ week Derry have this week due to Bray’s FAI Cup semi-final could not have come at a better time with Hegarty hopeful most players will have recovered in time to face Bray in the final home game.